Sergeant Bradley Freitas was named the Hawaiʻi Police Department’s 2012 “Top Cop” for the Law Enforcement/Security Coalition of Hawaiʻi. 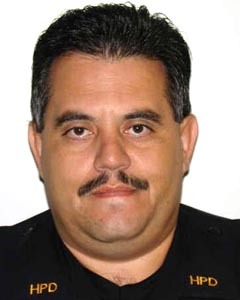 Freitas, a 22-year veteran of the Hawaiʻi Police Department, is commander of Kona Patrol’s Special Enforcement Unit, a four-person unit consisting of Kona patrol officers and Community Policing officers. Its objective is to reduce calls for service with special attention to major property crimes by using intelligence and relying on crime analysis, informants, enforcement and in coordination with other Police Department sections. In the last year, the Special Enforcement Unit initiated 188 cases, leading to 48 felony arrests. The arrests resulted in partnerships with the Criminal Investigations Section that ultimately led to 114 felony charges. The prestigious award was presented at a luncheon Thursday (October 25) at the Manoa Grand Ballroom on Oahu.